The reason you always keep an extra supply of cooked and shredded chicken breast stocked in your freezer? 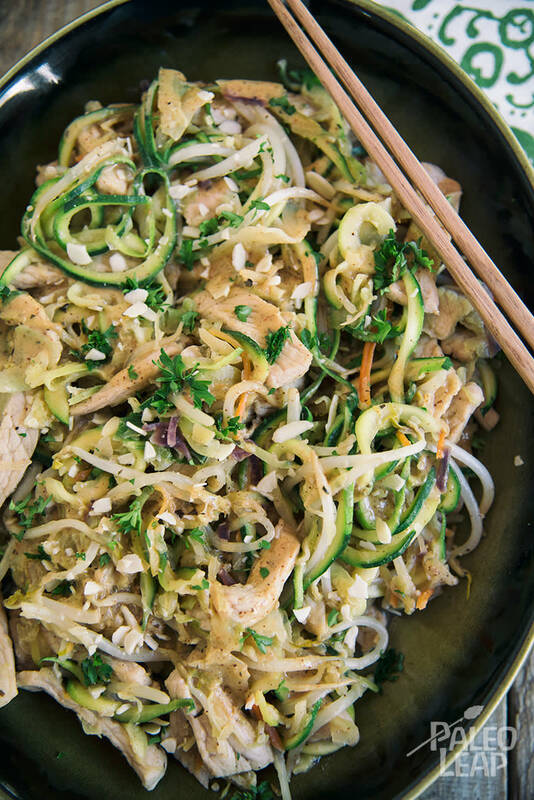 Almond butter chicken with zucchini noodles is the definitive answer to your dinnertime challenge. Forget overly processed take-out meals, instead use up your Paleo leftovers to make amazing and satisfying meals. In less than 40 minutes, you will create a dish that will cover your plate with the most delicious almond butter sauce you have ever tasted. One requirement here, you must love almond butter, and not just in your keto chocolate almond butter fat bombs. Almond butter, the kind made without sweeteners is incredibly rich and tasty. It’s good to add it to your meals in smaller doses – don’t go eating the entire jar at once! Combine this with coconut aminos and you’ll create a sauce reminiscent of the peanut based ones in Chinese or Thai cooking. And this with a slightly sweet-sour sauce combines perfectly with freshly spiralized zucchini noodles and chicken. Once you discover your love for coconut aminos, you’ll soon be making your own Paleo hoisin sauce, marinating lemon grass short ribs and rolling up a batch of Asian five-spice meatballs. This is a delightful meal that can easily be reheated for lunch the following day. Serve it over a bed of mixed greens and shredded radishes, for an extra green, healthful crunch. In a bowl, combine all the ingredients for the almond butter sauce and mix well. Add the garlic, and cook until soft, about 3 to 4 minutes. Add the carrot, cabbage and bell pepper; cook for another 3 to 4 minutes, or until veggies soften. Next add the shredded chicken, zucchini and bean sprouts to the mixture, then cook for 3 to 4 minutes. Add in the almond butter sauce and stir well, cook for another 4 to 5 minutes.